Poet Matthew Caretti: I think Lochlann’s rendering of the Greek flag is the perfect exclamation point for the haiku, which begins with a troubling ancient myth. Her piece then punctuates the dilemma facing modern Greece and several other members of the EU—where do culture and economics intersect? And to what degree should the latter take the lead? 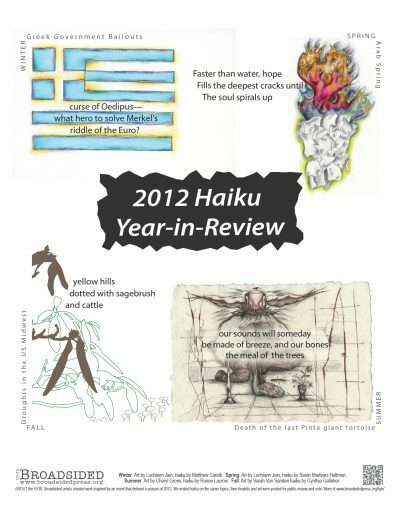 How do you think the four art/haiku combinations create a conversation about 2012? Poet Matthew Caretti: We are beginning—finally—to confront the inextricable connections between economics, politics and the environment. The HYIR contest ask artists and poets to think outside the box. More and more, society will be called upon to do the same if we are to create a more just, verdant and compassionate world. Poet Matthew Caretti: Composing haiku, for me, is most often a spontaneous act inspired by a natural event or image close at hand, one that resonates with some deeper truth about human existence. The HYIR, however, required a more cerebral and reflective approach, as the themes connected to our shared humanity but were not immediate in regards to my own sensate world. Again, many thanks for your message and for the ever-inspiring Broadsided creations and contests. All the best to you and to your team in the new year! Artist Løchlann Jain: Yes. The haiku sprung from the nationalism/mythology of Greece, to the international quandary of the Euro. The haiku made me see the symbol of the flag in that context, rather than as the abstract design I was playing with in making the art. Artist Løchlann Jain: I agree with the poet that her haiku pulls the reader firmly down (into the “deepest cracks”), before lifting (spiraling) upward. With the drawing I was working with the idea/cliche of going up in smoke, destruction and creation, paper and cloth (bureaucracy and everyday life), and fire as a container for something new and unknown. I like the way the haiku makes me think about how easily fire can be expunged, and thus brings a new layer to the metaphors I was playing with. Poet Sarah Martinez-Helfman: I think of hope originating in the deepest part of us and so I chose the concept of ground water in my haiku because it finds and fills the deepest cracks in the foundation of the earth. Yet, hope released into the universe is an upward spiraling energy like fire, and fire is equally able to create and destroy. In this way, fire is a fitting portrayal of the Arab Spring, in all of its complexity. Artist Løchlann Jain: A contribution or art and poetry to any discussion in my view lies in the ability to suggest and provoke, rather than in making any argument or claim. I couldn’t claim that the combinations, for me, created a conversation as much as a mash-up of impressionistic engagements. Poet Sarah Martinez-Helfman: Most big moments, both mourned and celebrated, have to do with transitions. In this case, all four art/haiku topics reflect a transition from one state to another. Whether we’re talking about a species or a political movement, the economy or the environment, the conversation is about our role in these changes and whether we are engaging with compassion and accountability. Artist Løchlann Jain: I was curious to see what kind of juxtapositions would result. Poet Sarah Martinez-Helfman: Any opportunity to write a Haiku inspires me! I chose to write about the hopefulness of the Arab Spring because I’m a glass-half-full kind of person. I alternatively could have written about the concern that good intentions can, and often do, lead to unintended consequences that cause great suffering. Poet Renee Lacroix: At a glance, I wasn’t sure that folks would be able to see the relationship between the art and the poem. However, after stepping back from it and understanding how it will appear on the broadside, I think the art captures the same thing as the poem—a sad, but inevitable, ending. Artist Cheryl Gross: Yes and no. I voted for the title and kept tabs on the results. I like the fact that the art and poetry melt into an abyss. I wanted the drawing to convey depth and silence, almost as if it were a resurrection or a wake. I incorporated elements/symbols that refer to death, to keep the viewer engaged, and not disgust them. Otherwise you defeat the purpose of communicating. And it’s always interesting to hear/read someone else’s interpretation. Lonesome George was the most literal and that’s why I chose him. I found him endearing. Poet Renee Lacroix: The combinations remind us that many things are beyond our own individual control, but that collectively, we make life happen. Whether it be in the form of an economic crisis, community issue, ecological or environmental event, we all contribute in some way to our collective fate. (No, I was not previously assimilated by the Borg ). Artist Cheryl Gross: It’s all about death/endings, and change. The end of our monetary system, climate change, etc. Will the end of this species/system make room for a new one of its type? Or will it remain extinct with nothing to replace it? I believe we have been having this conversation for some time now, and it doesn’t just pertain to 2012. I think people are worried about what will happen next. Poet Cynthia Gallaher: I wrote many haiku during a trip out on the open road with two other poets this past year, and there were several that addressed the drought that devastated the center of the country. When I heard about the haiku contest on the same theme, I was definitely moved to enter. And when I saw the art work to be teamed with the haiku, it again drove the message about how widespread and impactful the drought had become, not only to agriculture and pasture animals, but also to nature in general and all wildlife. Artist Sarah Van Sanden: Honestly, it made me like it much better. In an effort toward simplicity, the drawing felt unfinished to me, maybe a little too mute. The haiku gave the image much more visual interest and anchored the drought conversation in a less oblique way. Poet Cynthia Gallaher: We have become a visual-oriented society with fewer words expressing deep thoughts, whether through Twitter, text or time-honored haiku. The combination of art and brief words can be as moving, powerful and controversial as more wordy analyses. Artist Sarah Van Sanden: I appreciate most the way each season/event’s haiku and image work together to create their own balanced ecology. These events are all powerfully anxiety-producing and not without historical precedent. Where the images actively express anxiety (the fire of the arab spring image, the unsettling linework around Lonesome George), the haikus respond with hope or a reminder of our part in a larger, cyclical existence. Where the images connect visual concepts without an emotional voice, the haikus ask big, scary questions or speak bluntly about bleak conditions. I think this process mirrors how we all look at the unsettling situations around us with a variety of lenses and from different angles, grappling to understand them more completely. Poet Cynthia Gallaher: On a two-week open road trip I took with two other poets this year, I chronicled the trip through a series of 100 haiku. The widespread drought through the center of the country inspired me to write this particular haiku because of what lay right before me. I wrote simply what I witnessed with my own two eyes. The rolling hills ordinarily green with grass were dried and yellow, and there were only scattered sagebrush, with as many cows dotting the landscape. What would the cows eat? I couldn’t begin to guess. Such landscape went on for dozens, then hundreds of miles, along the highways leading from Chicago through South Dakota. Artist Sarah Van Sanden: We are so bombarded by the constant news cycle, it’s refreshing (and sad, too), to be asked to dig a little deeper and compose a meaningful response to a single event. It feels like grabbing a sentence from my peripheral vision and fleshing it out in front of me. NOTE: Inspired by Carrier’s Addresses and a deep commitment to public art, the HYIR is a special feature that debuted at Broadsided in 2010. Four artists created work in response to an event that, for them, dominated a season of the past year. We placed an open call for submissions of haiku that did the same. The art and the poems selected as finalists were posted online, and we asked you to vote on the winning combinations. Writer Matthew Caretti: Influenced in equal parts by his study of German, his Zen training in the East, and the revolutionary Beat movement, Matthew has published his haiku and related forms in Contemporary Haibun Volumes 11 & 12, Haibun Today, Take Five: Best Contemporary Tanka, Vol. 4, as well as the forthcoming Now This: Contemporary Poems of Beginnings, Renewals, and Firstsand The Unspeakable Body: Breaking Tanka Taboos. He currently teaches English and directs the Writing Center at a college preparatory school in Pennsylvania. Artist Løchlann Jain is a professional anthropologist. Writer Sarah Martinez-Helfman has lived in four countries and considers herself a world citizen; her simple mission in life is to leave the world better than she found it—especially for vulnerable children. She writes haikus for fun, and they cover her office door. Last year, Sarah won a crate of avocados in a haiku contest and made lots and lots of guacamole to celebrate Cinco de Mayo. Writer Renee Lacroix is an ever-hopeful poet living in the Buffalo, NY area. She is the author of she’s a poem waiting to happen and it began unfolding so that i may find truth (out of print). Having survived the Buffalo October storm of 2006, two late-in-life pregnancies, and the dreaded Mayan prophecy of the end of the world, she figured she’d better stop tempting fate and start submitting poems again! She is currently working on her next book, a controlled state of sadness, due out in 2013. Artist Sarah Van Sanden lives in Seattle, where she takes every opportunity to relish in urban nature. She has studied visual art, botany and design and makes her living designing and building landscapes. In her spare time she works on various creative projects with plants and plant materials.